L: 60" x W: 18" x H: 38.5"
Higgins Server Your stylishly casual dining experience is here with the Higgins server. The Higgins collection brings the beauty of natural wood to your dining room with rustic poplar frames and beautiful weathered oak veneers. With this set, you'll want to host every dinner party. Your stylishly casual dining experience is here with the Higgins server. The Higgins collection brings the beauty of natural wood to your dining room with rustic poplar frames and beautiful weathered oak veneers. With this set, you'll want to host every dinner party. The server didn't look as big in the showroom as it does in my kitchen but it has a lot of storage and I love it. I love your furniture, they quality is the best! Your sales people are very knowledgeable and personable. I will continue to shop at your store! We highly recommend this item. It is spacious and allows for plenty of storage. I can’t wait to use the buffet for our next family gathering for added counter space. The server adds charm to our home and allows us for wine o’clock every day in the comfort of our own home. Wine O’Clock everyday in the comfort of our own home! 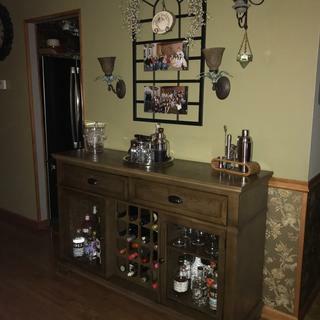 Is there a shelf to replace the wine rack in this buffet? The wine rack in this server is permanent and doesn't come with a separate shelf. Perhaps Raymour & Flanigan has another model without the wine rack. I hope this helps. BTW - I really love this server!